RRP £89.99 Grab a Bargain while they are still in stock. ECG accurate : Provides accurate heart rate data. Personal zone test : Automated 15-minute self-test that determines personalized target heart-rate zones. Pulse mode : Displays heart rate, accumulated calories, current zone, and accumulated exercise time. Graph mode : Graphically displays heart rate over one hour interval. Data mode : Recalls exercise time, average heart rate, time in each zone, and calories for last exercise session. Other functions : Time/date display, 2 alarms, 2 time zones. S-shaped design : Curves around the wrist for improved comfort and read. Ergonomic chest transmitter: Provides increased comfort. Mineral glass crystal : Scratch-resistant. Nike Electrolite : One-touch backlighting. Face Diameter : 43mm (1.7"). Face Depth : 16mm (0.6"). Includes chest strap and software. 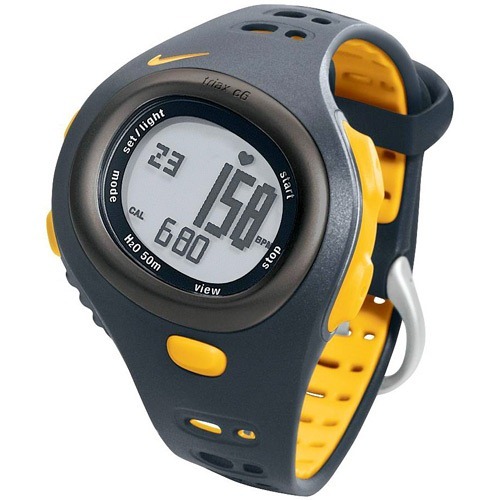 This men's Triax C6 heart rate monitor watch from Nike features accurate heart rate data and recording, a real-time calorie counter, 4 heart rate training programmes, digital time display, an ergonomic chest transmitter with battery hatch all with time, date and alarm functions. Complete with full instruction and software and all accessories. Exercise has never been as important as it is today. The highly stressful lifestyle has taken its toll on your heart, body and mind which can be only combated with exercise. To aid you in your endeavour Nike, the well known name in the world of fitness has introduced the Nike Triax Heart rate monitor watches. These heart rate monitor watches will give your fitness efforts a new direction. 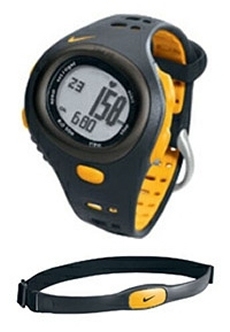 Since there are many heart rate monitor watches the market, it becomes difficult to choose one from the wide variety. There are many watches with a truckload of features and complex buttons and dials. However, the important point to remember here is that more complex a gadget more the maintenance required. Moreover you don’t need much gadgetry while running. All you need is the speed, time and distance along with your heart rate and the target heart rate. Hence Nike has followed the suite and kept it simple so that a runner need not stop to check the statistics. The Nike Triax C6 heart rate monitor takes heart rate monitoring one step further than the Nike Triax C5. It has introduced four heart rate training zones. This does not mean that you have to train in all four zones in a given exercise session, however. You can still be aiming to train in one zone, say, Z2 the Medium Zone, for example. When your heart rate drops below Z2 (and so ends up in Z1) or rises above Z2 (and ends up in Z3), you get to hear a beep to remind you that you have crossed the zone limit. Better still, at the end of your exercise, you can see how much time you spent in each of the Z1 to Z4 zones. Hopefully you will find that you have spent the majority of your time training in Z2 (your target zone for this session) and in so doing you have achieved your training objective. The Personal Zone Finder test gives you your own heart rate limits for easy exertion (Z1), medium exertion (Z2), hard exertion (Z3) and very hard exertion (Z4). According to Nike, this is considerably better than following a particular set formula or looking up a particular table to find your own zone limits. The test takes into account what your body i.e. your heart rate is telling you. You do this test about once a month. If you are watching your weight or engaging in a weight loss program, you will welcome the addition of the calorie counter. The Nike C6 heart rate monitor has this rather unusual feature which shows a bar graph of your average heart rate over time. You can use this to see if you have been training according to your plan. 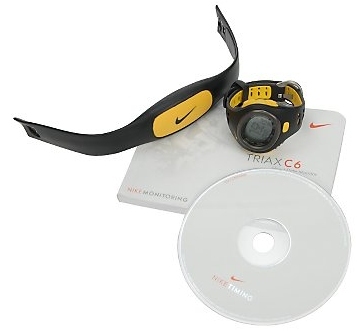 The Nike Triax C6 is a great way to get fit and stay fit. It’s easy to operate and does not require a tech savvy person. A normal layman can operate and understand it. The weight loss and the inch loss come later. The first thing that improves is the heart rate. You can monitor your body’s progress by monitoring your heart rate. 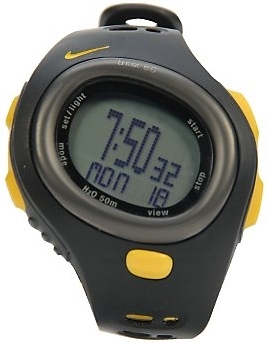 These fantastic Nike Triax Watches are ex-display / customer returns from one of the UK biggest high street retailers, and as such have some cosmetic marks on the packaging and some light signs of being demonstrated on the actual items, nothing that will detract from the normal use, and are complete with all original accessories, software and manuals. RRP £99.99 Grab a Bargain while they are still in stock. Please note: All these items are either ex-display customer returns, direct from major UK retailers and as such will have been opened to check all items are correct and working. I try to describe the items as best as possible, if you have any questions about any specific item please e-mail before bidding and I will be happy to provide any additional information I can.